The Novel Jazz Septet, in conjunction with the Bangor Theological Seminary will present a concert at the Gracie Theater in Bangor 7 p.m. Tuesday, Jan. 10. The show is entitled, "Duke Ellington & Billy Strayhorn: Sacred & Secular — A Life Mix". 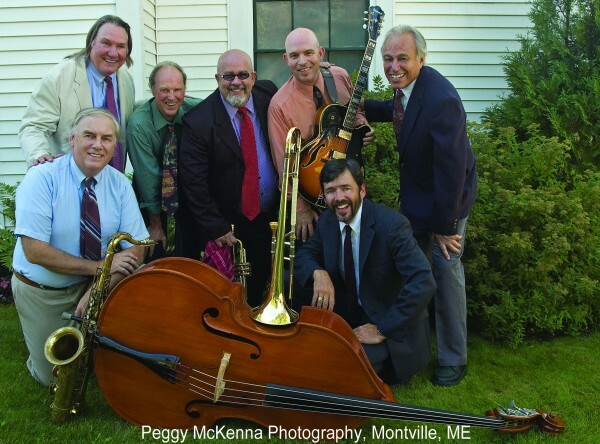 The band features (clockwise from left) Herb Maine (bass), Bill Friederich (drums), Bruce Boege (saxophone), Mike Mitchell (trumpet), Dave Clarke (guitar), Mickey Felder (piano) and Barney Balch (trombone). BANGOR, Maine — The winter gathering sponsored by Bangor Theological Seminary has changed little over the past century. For more than 100 years, it has been a blend of traditional worship services, lectures and panel discussions. Convocation 2012 will include some lectures, but it also will feature multimedia presentations, weave the secular with the sacred, and include evening concerts for the public. “It’s going to be a very meaningful, deep experience this year — a mosaic of the arts and spirituality,” the Rev. Bill Friederich, a 1997 seminary graduate, said Monday. An accomplished musician, Friederich helped organize this year’s convocation. This year’s theme is “Evolving World, Emerging Church.” The convocation will be held Jan. 9-11 at the Gracie Theatre at Husson University. “The music is expressive of the larger message of convocation,” Interim BTS President Robert Grove-Markwood said in December. That message is about the role art plays in spirituality around the world and the use of multimedia and the Internet to convey the message of the Gospel. Darkwood Brew is a ministry that broadcasts a weekly experimental worship program over the Internet. Two of the people behind that ministry will perform live at 7:30 p.m. Monday, Jan. 9. Darkwood Brew blends ancient liturgical and spiritual practices with interactive technology to create a 21st century worship experience. “Eric Elnes and Churck Marohnic will show how multimedia can enhance a worship experience in a coffeehouse setting rather than a traditional sanctuary,” Friederich said. The Novel Jazz Septet, one of the groups Friederich regularly plays with, will perform at 7 p.m. Tuesday, Jan. 10. The seven-piece band will perform sacred and secular music written by Duke Ellington and Billy Strayhorn. Noel Paul Stookey and his wife, Betty Stookey, will draw from many faith traditions in a presentation at 4 p.m. Monday, Jan. 9, called “One Light, May Candles. Their workshop will combine singing with the spoken word. The convocation will end with Friederich leading the closing worship service. The “sermon” will be a 20-minute segment that will blend improvised music as paintings and words flash on a large screen, he said. The event is being held earlier in January than in the past. Husson’s spring semester will start Jan. 17. For information, visit www.bts.edu or call 942-6781.